Cool Water Blog » What’s New? Praise the Lord! Volume 3 is done! This is the 15th day of the first month of our four month sabbatical from Osaka International Church. The first two days of the sabbatical were great. I got up early, went to the gym, had a good swim and accomplished lots of things. Then came the colds, which lasted for about ten days. I hope to get back to the gym and swim again soon. This month, we are trying to get caught up on things that are behind, like personal letters, tax forms, legal stuff, web site maintenance, and personal health care and we are also working on various projects. Starting this blog and updating the proverbs2525.org website are high on the, “to do,” list. I am also joking about, “growing a beard,” being one of my projects. After two weeks, my first beard ever is beginning to look like something, although I am not sure what. As you can see in the photo, the other big news for today is that Karen’s DVD projects has taken another big step forward. The delivery man brought eight boxes of Japan Video Praise Volume 3 to our door this morning. 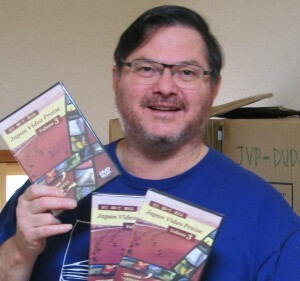 Now all three volumes of Japan Video Praise are ready for sale. In a couple of days Volume 3 will be in Christian bookstores across Japan, and it is already available for ordering on Amazon.com and on Amazon.co.jp. It is our prayer that these DVDs will be a blessing to Japanese-speaking individuals and small groups around the world.